The Gold Country Gymnastics’ Level 4 boys squad shined in San Luis Obispo, earning fourth place as a team at SLO Fest. 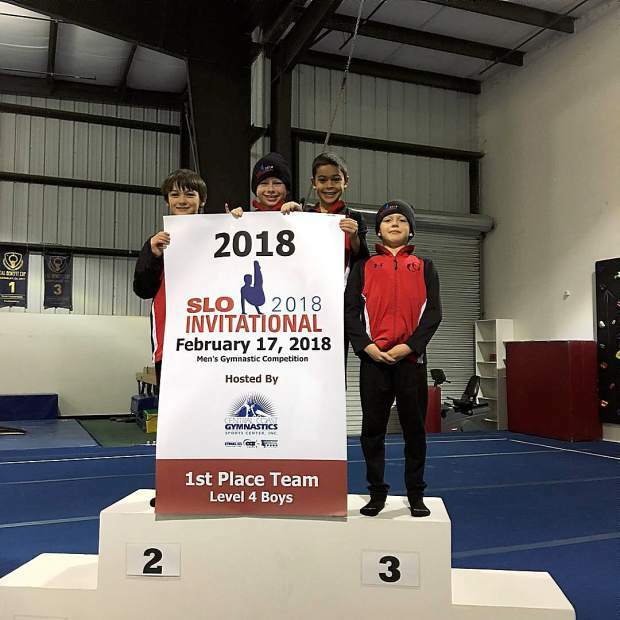 The Gold Country Gymnastics’ Level 4 boys squad brought home first place as a team after a stellar effort at the SLO Invitational in San Luis Obispo over the weekend. Leading the Level 4 boys was Nicholas Husak, who placed first all-around with a 57.6. Husak was first on the floor exercise (9.3), first on the pommel (10.0), first on the rings (10.1), second on the high bar (9.8), fourth of the parrallel bars (9.1) and fourth on the vault (9.3). Robert Campbell was second all-around with a 55.7. Campbell was especially strong on the high bar, finishing in first place with a score of 10.1. He also placed second on the floor exercise (9.1), second on the rings (10.0) and third on the pommel (9.2). Desi Oakes was also strong, earning fifth all-around (54.9), taking third place on the pommel (8.5), the rings (9.8), the vault (9.4), the parallel bars (9.2) and the high bar (9.8). Cassius Wondergem rounded out the Level 4 boys team with a sixth place finish all-around (54.7). Wondergem was strongest on the rings with a fourth place finish (9.8). In Level 6, Amador Osorio shined with a second place finish all-around (52.8). Osorio earned first place marks on the rings (9.1), vault (9.3) and high bar (9.7). Willow Dane placed third all-around in Level 6 after top-three showings on the rings (8.6), the vault (8.9) and high bar (8.6). In Level 5, Austin Whitman led the Gold Country team with a third place finish all-around (54.1). Whitman placed third on the floor exercise (8.5), pommel (9.9), and high bar (9.0). Jayden Echternacht was fourth all-around (50.3) in Level 5. He was especially strong on the vault, placing second with a score of 9.3. Next up for the Gold Country boys team is a meet in Palo Alto March 3. The Gold County girls team made their presence known at the Wildflower Invitational in Oroville, earning multiple top-five finishes individually. Competing in the XCEL Gold Division (middle age group), Teran Baker placed third all-around with a season best score of 35.825. Highlighting Baker’s performance was a second place finish on the beam (9.25). In Level 6 (older age group), Megan Kiser took fourth all-around with a season best score of 35.40. Kiser’s best event finish was on the beam where she took second (9.475). She also placed fourth on the floor exercise (9.175). Alyssa Herbert also set a season best all-around score (34.225), and placed fourth on the beam (9.4). In Level 6 (middle age group), McKinley Nguyen finished with an all-around score of 35.675 and posted strong scores on the beam (9.0), vault (8.725) and floor exercise (9.025). In Level 5 (all ages), Darcy Leishman finished fifth all around after placing fourth on the beam and on the floor exercise. The Gold Country girls team gets back into competition March 3-4 at the Elevate Gym Fest.